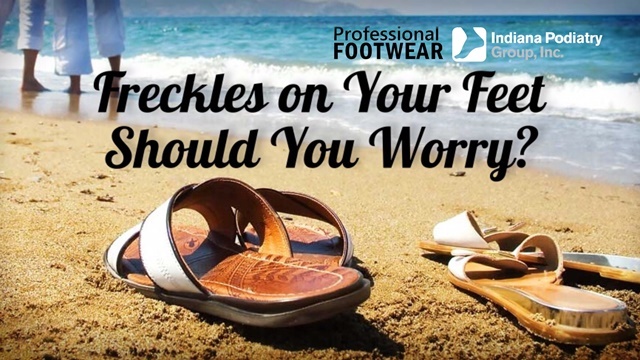 Freckles on Your Feet: Should You Worry? It’s not a tumor …or is it? This summer be sure to lather on the sunscreen. I have to say that I am happy to see the awareness that has been brought to skin cancer and sun exposure over my lifetime. I know as a kid I suffered many sunburns and wearing sunscreen wasn’t pushed all that much. I remember too, kids bragging about their tans and how they didn’t have to wear sunscreen. Personally, I could get a sunburn sitting under a 15-watt fluorescent bulb. Nonetheless, as we collect freckles over the years we as foot doctors pay attention to odd looking lesions seen in the feet. The foot is not a common place to have freckles and if they are on the sole of the foot, in-between toes, etc.…it might be pertinent to biopsy these. I have seen several patients over the years that a simple biopsy saved their life as we identified melanoma early on and the patient was able to resolve completely with early treatment. If you have a skin lesion on your foot and especially if it is has changed size, shape, color, etc.…have a professional at Indiana Podiatry Group take a look…it might save your life.